The heart of the furnace – known as the piazza in Venetian. 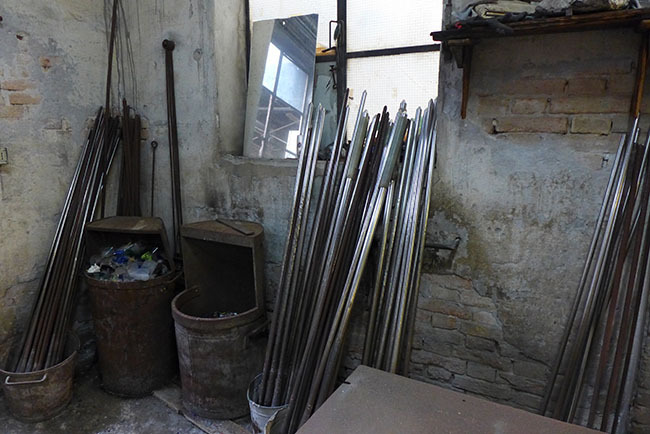 The highlight of everyone’s trip to the island of Murano is a visit to a real glass furnace. 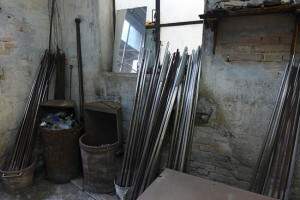 They are hot, noisy, busy places with the choreographed dance of the glass workers. But here’s how an abandoned furnace looks, too quiet, too many useful tools left idle. 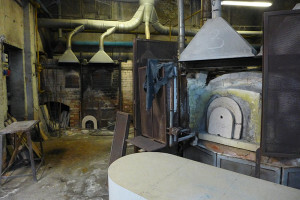 We went with a friend who was considering buying the old furnace and turning it into yet another Murano Glass Shop. On the left is the heart of the furnace, the crucibles (piazza) where the glass is melted, where the glassblower dips the blowpipe into the sea of red molten glass. It is the hub of activities, the apprentices gathering glass for the master and each little door holding a different color of molten glass. 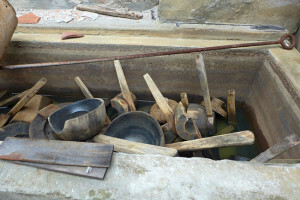 All the tools used were still in place, clean and prepared for the next day’s work. 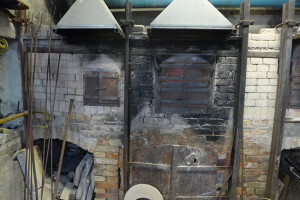 The blowpipes in this picture or the right are standing by the heating oven which keeps them at the ready for the glass master. 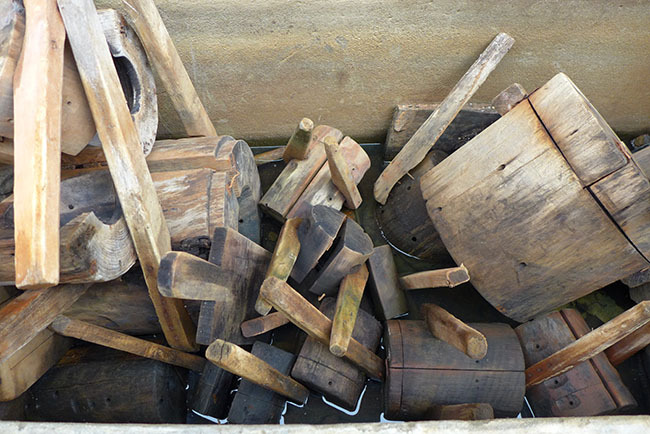 And in the left picture you see a selection of punties (pontello in dialect) which are used to transfer the finished piece or to bring a little glass to the master to use as trim. It was a sad sight, even the clock as it stopped on their final day of work. The chalkboard still shows the drawings of the last pieces blown, classic footed Venetian Wine Glasses with the traditional golden dolphin, or sometimes it is a dragon. 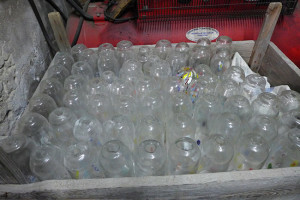 While the work floor still held “bevantes” the drinking portion of a stemed glass waiting to be joined. In production furnaces the wine glass are made in sections to be joined together in the final step. 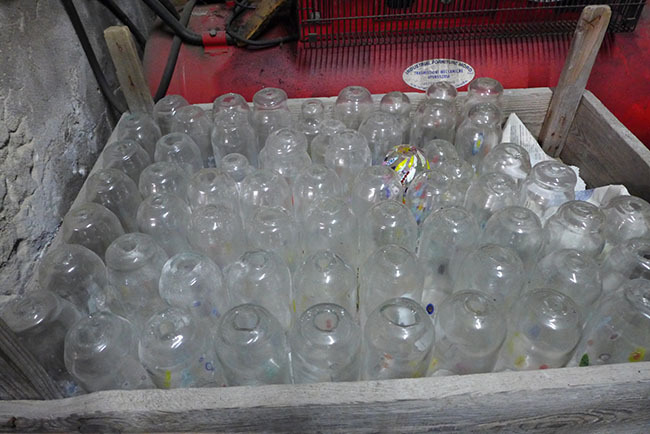 Often when work was slow, the glass blowers would blow these to have ready for the arrival of an order. When one factory received a large order, smaller ones like this could assist by making a part of the glasses. 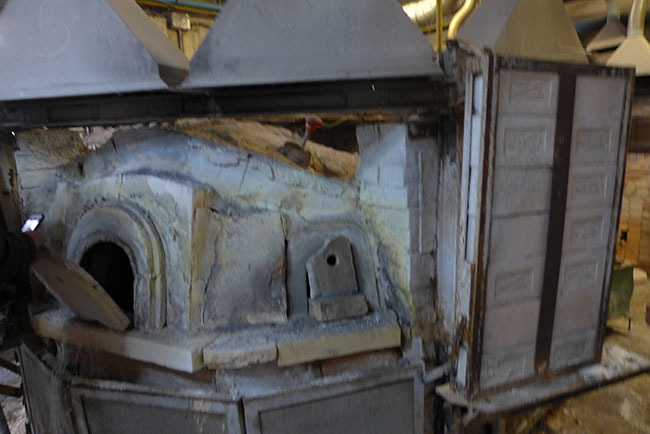 They are then put back into the “muffola” (annealing oven) to heat before they are joined with hot glass to the decorative foot. Bevante – Waiting to be completed. The wooden blocks used the the glassblower to keep the bubble round still sit by the maestro’s bench. They are kept in buckets of water to keep the wood moist and the maestro dips into the water frequently to avoid setting the wood on fire. As you can see a production furnace in Murano is not elegant, it’s dusty, hot and fraught with dangers. But they are always orderly. And even in it’s demise, the tools were in their places – as though the next morning at 7a.m., the workers would all appear. 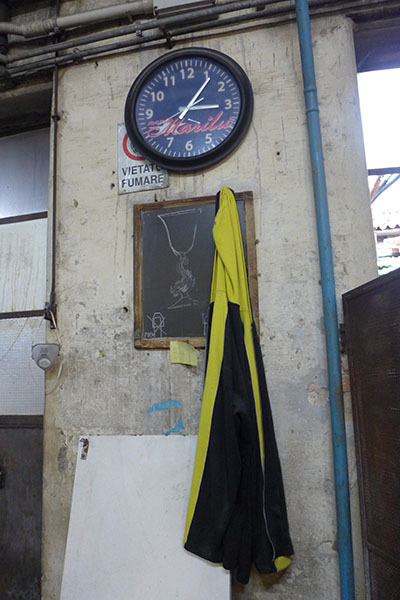 See how the workers shirt still hangs by the furnace. Sadly, the end of an era. I am sorry to see even one furnace close. Perhaps I will never see Venice but I will see the beautiful art made there. We agree, it is very sad, unfortunately the victim of less expensive imports and the world economy and its closure creating more economical crisis for the island of Murano. Even if you can’t go to Venice there are so many videos available on the web. We’ll do a blog on how you can see Venice from your computer.